Pioneer Square is Seattle's oldest neighborhood, showcasing a wealth of art galleries, bookstores, antique shops, cool restaurants, and buzzing nightclubs within easy walking (or free bus) distance of most Downtown Seattle hotels. The classic red brick buildings, cobblestone streets and horse-drawn carriages are a reminder of life a century ago. Local lore holds that the term "skid row" originated in Pioneer Square, when timber would be slid down Yesler Way to a steam powered mill on the Seattle waterfront. The area sits, from east to west, between 3rd Ave. and the waterfront; and between Downtown proper to the north, and the sports stadiums to the south. Just to its east, the International District is the name given to Seattle's Asian neighborhood. It is located southeast of Downtown, loosely bounded by 4th Avenue S. and S. Dearborn Street. While the old Chinatown stops are concentrated around the Interstate 5 freeway, the area to the east is called Little Saigon, centered on 12th and Jackson. From there, going south along Rainier Avenue, the stores transform from Vietnamese to Cambodian, beyond which it slowly merges into South Seattle. It is easy to get here from the Downtown hotels – the walk is short, and any bus traveling south from Downtown will get you to within a few blocks of your destination. There are a few pay parking lots, and limited street parking is available too. Often the best parking bet are the metered spaces under the Alaskan Way Viaduct, which are usually overlooked by all but the locals. Occidental Street, which sits between 1st and 2nd Avenues, is closed to cars between Washington and Jackson Streets and forms a pedestrian mall lined with galleries and shops. Most city buses that go to Downtown Seattle from other parts of the city terminate in or pass through the area. From central Downtown, it's about a five-minute walk due south toward the stadiums. One tourist-focused line is King County Metro's free Route 99 service, which runs along 1st Avenue past the ferry terminal, aquariums, and Pike Place Market downtown. However, service is quite infrequent. Buses and trains in the Downtown Seattle Transit Tunnel make stops at Pioneer Square Station at James Street/3rd Avenue (a few blocks north of the main neighborhood) and at International District Station at Jackson Street/5th Avenue. King Street Station, served by Amtrak and Sounder commuter rail, sits directly in the center of the area at 4th and Jackson. The First Hill Streetcar line runs along Jackson Street through the area, connecting the district to First Hill and Capitol Hill. 47.601925-122.331730555561 Smith Tower, 506 2nd Ave, ☎ +1 206 622-4004. Self-guided tour daily 10AM-9PM; observatory & bar Su-W 10AM-11PM, Th-Sa 10AM-midnight. 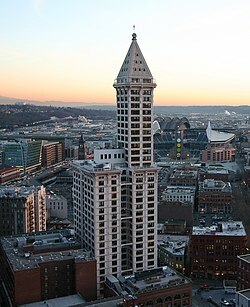 Built in 1914, the Smith Tower was Seattle's first skyscraper, and the tallest building on the West Coast for nearly half a century before being overtaken by the Space Needle. Uniformed attendants operate the old copper and brass elevators from which you can peer into the different floors and offices as you ascend, an experience most people today have probably only witnessed in old movies. The outdoor Observatory on the 35th floor wraps completely around the four sides of the tower, providing panoramic views of the Olympic and Cascade mountain ranges, including Mt. Rainier, as well as of Elliott Bay, Downtown Seattle, and Pioneer Square. The interior of the 35th floor contains a speakeasy-themed bar, formerly known as the Chinese Room for its ornately carved ceiling and a number of decorative flourishes imported from China in the early 20th century. There is a 40 minute self-guided tour (separate admission fee) about Seattle's history from the 1920s and beyond that is available. Tour and observatory: adults $19; seniors, children, military $15; 10% discount online. Locals $12 in-person only. After 9PM, observatory only $12. 47.59938-122.331892 Klondike Gold Rush National Historic Park - Seattle Unit, 319 2nd Ave S (at S Jackson St), ☎ +1 206- 220-4240. Daily 9AM-5PM except Thanksgiving, Christmas, and New Year's Day. A key attraction in the Pioneer Square area, this is the Seattle branch of the Klondike Gold Rush National Historical Park, the remainder of which is in Alaska. The site highlights the city's key role as the "Gateway to the Gold Fields" for most of the Klondike stampeders of 1897-1898. National Park Service Rangers and volunteers staff the museum and can provide information and perspective not only on the gold rush but also on Seattle's past. The museum contains many artifacts and historical photographs related to the Gold Rush, and movies about the gold rush and Seattle's history are shown upon request (except in summer, when they're shown on a regular schedule). Rangers also conduct free walking tours of the Pioneer Square area in the summer and demonstrate gold panning to school groups. Free. 47.59825-122.322943 Wing Luke Museum of the Asian Pacific American Experience (The Wing), 719 S King St, ☎ +1 206 623-5124. Tu-Su 10AM-5PM. The first Smithsonian affiliate in the Pacific Northwest, this museum features exhibits and programs related to pan-Asian American art, history, and culture as well as historic and neighborhood walking tours. $12.95 adult, $9.95 students/seniors, $8.95 children. 47.5997-122.3134 Seattle Buddhist Church, 1427 S Main St (south of Yesler Way). In the summer the community hosts a Japanese bon odori festival on the street out front. 47.60199-122.333886 Pioneer Square (Yesler Way and 1st Avenue). Pioneer Square proper is just a small corner park that's often occupied by homeless folks, but generally safe during the day. 47.6-122.33297 Occidental Park, Occidental Ave between Main St and Washington St, ☎ +1 206 684-4075. 6AM-10PM. This urban park is best known for its four totem poles carved by local artist Duane Pasco. Free. 47.59859-122.32548 Hing Hay Park, 423 Maynard Ave S. A small park in the center of Chinatown. Though you're not too likely to see old folks doing tai chi or playing checkers, it still has character. 47.60021-122.331989 Waterfall Garden, 2nd Ave at S Main St. This small, tranquil park features a 22-foot high waterfall cascading over granite boulders. The park occupies the site where two 19-year olds, James Casey and Claude Ryan, began a messenger service in 1907 in the basement of a tavern, which eventually grew up to become United Parcel Service (UPS). The Annie E. Casey Foundation, started by James Casey and his siblings in honor of their mother, created the park and maintains it "in honor of the men and women of United Parcel Service." Art Walk. The Art Walk is almost synonymous with Pioneer Square and takes place on the first Thursday of every month. Galleries are open until 9PM. Show up early for the free wine and hors d'oeuvres. 47.59823-122.32621 Venus Karaoke, 601 S King St, Ste 102. One of the few karaoke rooms in the city. Rented by the hour, with a good selection of Cantonese, Mandarin, and English songs. Open late, with two bars upstairs. 47.598-122.324872 Seattle Pinball Museum, 508 Maynard Ave S, ☎ +1 206 623-0759, e-mail: seattlepinballmuseum@qwestoffice.net. Su-M 12-17:00, Th-Sa 12-22:00. A pinball machine museum where all the machines are on free play once you pay admission. There is soda and beer available. $13/adult, $10/child. Seattle's oldest neighborhood has a hidden history: after being destroyed by a fire in 1889, large parts of the city were regraded, simultaneously solving the problems of steep hills, tidal flooding, and sanitation by raising what is now Pioneer Square by one story, creating the Seattle Underground. Today, two companies run multiple tours through the Underground, with informative commentary about Seattle's history. You will have to go up and down several flights of old stairs, and walk over some uneven terrain in poor lighting; choose footwear appropriately. 47.60275-122.334163 Beneath the Streets, 102 Cherry St, ☎ +1 206 624-1237. Daily 10AM-4:30PM. Tours every 30 minutes. Groups are limited to 25 people for a more personal experience. Tours last 60 minutes. Spanish language tours available by appointment. $19. 47.60275-122.334164 Beneath the Streets' Red Light District Tour, 102 Cherry St, ☎ +1 206 624-1237. Th-M 6:30PM. An adults-only tour with a focus on the "underside" of underground history: prostitution, gambling, drinking and vice. 18 and older. Tours last 90 minutes. $22. 47.602-122.3345 Bill Speidel's Underground Tour, 614 1st Ave, ☎ +1 206 682-4646. Apr-Sep daily 9AM-7PM, Oct-Mar daily 10AM-6PM. Tours on the hour; Jun-Aug also on the half hour daily 9:30AM-4:30AM. The original Underground tour. Tours last 75 minutes, including a 15 minute introduction. Adult $22, senior/student $20, youth (7-12) $10. 47.602-122.3346 Bill Speidel's Underground Paranormal Experience, 614 1st Ave, ☎ +1 206 682-4646. Jun-Aug daily 9PM, Sep F-Sa 9PM, Oct-Mar F-Sa 8PM, Halloween 10PM, Apr-May F-Sa 9PM. Search for ghosts and other paranormal activity at night. Tours last 90 minutes; arrive 15 minutes early to borrow and get trained on paranormal detection equipment. $33. 47.602-122.3347 Bill Speidel's Underworld Tour, 614 1st Ave, ☎ +1 206 682-4646. Apr-Sep daily 8 & 9PM, Oct-Mar Th-Sa 7 & 8 PM, extra tours some holidays. An adults-only tour with a focus on the red-light district. Admission include a cocktail. 21 and older. $27. 47.5974-122.327511 Uwajimaya Village, 600 5th Ave S, ☎ +1 206 624-6248. M-Sa 8AM-10PM, Su 9AM-9PM. The commercial, if not cultural, hub of the International District is Uwajimaya Village, a huge Japanese supermarket with many smaller eateries and a branch of the Kinokuniya bookstore. If you need anything at all from Japan while in Seattle, this is the place to find it. Most of the older businesses in the International District are, of course, Chinese, and there are a few general stores where you can pick up good woks and other imported items. Over in Little Saigon, the Viet Wah supermarket has Asian foods for a lot cheaper than Uwajimaya. True to its name, the International District has a great variety of ethnic cuisines. While tourists and most non-Asian Seattleites stick to the large Chinese restaurants, the smaller places serve mostly locals and offer a quite authentic atmosphere as well as food. Chinese seafood restaurants are a Seattle institution popular with locals, many with live seafood tanks; they're not particularly elegant, but the food is great (if a bit venturesome for some tastes). And while most of Seattle's immigrant Japanese population has long since moved out to the suburbs (as have the upscale sushi bars), a few restaurants still stick it out in the area. Some places, especially the hole-in-the-wall restaurants, only accept cash as payment. 47.59826-122.32621 Fort St. George, 601 S King St, ☎ +1 206 382-0662. Su-Th 11:30AM-Midnight, F-Sa 11:30AM-1AM. A restaurant/bar that serves Japanese-style Western foods like spaghetti and curry rice. Popular with exchange students and occasional Seattle Mariners. 47.59906-122.316562 Saigon Deli, 1237 S Jackson St (between S 12th Ave & S Boren Ave), ☎ +1 206 322-3700. Daily 7AM-6PM. This deli serves one of the best banh mi (Vietnamese sandwich) in Seattle. Crisp baguette filled with your choice of protein (meat or tofu), mayo, freshly pickled do chua (carrot and daikon), cucumber, cilantro and hot chilies, all for $3 or less! They also serve a variety of other Vietnamese delicacies. Sandwiches $3. 47.59813-122.326223 Maekawa Bar, 601 S King St (right next to Fort St. George), ☎ +1 206 622-0634. M-Th 6PM-midnight, F-Sa 6PM-2AM. Maekawa serves the Izakaya style of Japanese food. The menu has many different options like ramen, udon, bento, kaki fry (fried oyster), etc. They also serve a variety of Japanese beers and liquors like Oni Koroshi sake, Kirin and Sapporo beers. 47.59844-122.324784 Phnom Penh Noodle House, 660 S King St (at Maynard), ☎ +1 206 748-9825. M-Tu, Th 9AM-8PM, F 9AM-8:30PM, Sa 8:30AM-8:30PM, Su 8:30AM-8PM, W closed. Cambodian noodles and rice dishes which are considerably more exciting than Al Gore, who appears in a photo with the owner. 47.59948-122.315435 Pho Bac, 1240 S Jackson St, ☎ +1 206 323-4387. Daily 7AM-9PM. An odd, red boat-shaped shack serving Vietnamese noodle soup. Don't ask for a menu; the only choices are regular or large, and what kind of beef you want. 47.59903-122.322366 Green Leaf, 418 8th Ave S, ☎ +1 206 340-1388. 11AM-10PM daily. A popular Vietnamese restaurant. 47.60161-122.332397 Tat's Delicatessen, 159 Yesler Way, ☎ +1 206 264-8287. M-F 8AM-3PM, Sa 11AM-5:30PM, Su open 3 hours before any Seahawks, Sounders, or Mariners matches. East Coast style deli specializing in hoagies, including the delightful pastrami (dubbed Tastrami) and Philly cheesesteak with more varieties of cheese and wit's. Sandwiches: 8-inch $9, 12-inch $13. 47.59846-122.324188 World Pizza, 672 S King St, ☎ +1 206 682-4161. M-Sa 11AM-9PM, Su noon-9PM. Very good vegetarian pizza place with many different kinds of vegetarian pizza (a tasty vegan pizza is also available; call ahead to request it). The place also serves espresso, wine and Manny's Pale Ale on tap. World Pizza's signature pizza features roasted potatoes, garlic, rosemary and Gorgonzola. Happy hour Monday to Friday from 3PM to 6PM featuring $2.75 slices, and $2.50 bottles of Rainier beer. 16 inch pizza for $20. For a cheap eat, try a dim sum lunch. Roving servers bring steam carts of exotic (e.g., chicken feet) but often delicious food, then stamp your meal ticket for each dish. When you're done, take your ticket up to the register and pay. If you aren't a complete master of chopsticks, bring your own fork for the slippery shrimp and rice noodles, because the staff will rarely get around to bringing you one. If you're not getting what you want, or you don't see it, ask the staff - you may have to be a little aggressive. 47.59677-122.327439 Boiling Point, 608 S Weller St (at the corner of Uwajimaya), ☎ +1 206 737-8506. Daily 11AM-11PM. Hotpot style dining with your very own seemingly large pot and soup, with as much add-ons as you want. They also offer macaron ice cream. Lunch $12, dinner $13, selected soups +$3. 47.59763-122.3260910 Canton Won Ton House, 608 S Weller St (at 6th Ave S), ☎ +1 206 682-5080. M, W, Th, Su 11AM-11PM, F-Sa 11AM-midnight, Tu 11AM-5PM. Hong Kong-style noodle soup and congee (jook); great with a side order of Chinese donuts (you tiau). Very inexpensive. 47.59847-122.3274911 Henry's Taiwan, 502 S King St. Order the Locomotive Bento Box: cheap, large portions, and tasty. 47.59847-122.323612 Jade Garden, 424 7th Ave S (at S King St), ☎ +1 206 622-8181. M-Sa 9AM-2:30AM, Su 9AM-1AM. Local favorite for dim sum. While very popular, don't let the seemingly long wait for a table sway you -- the line usually takes less than 30 minutes. 47.59813-122.3251913 Purple Dot Cafe, 515 Maynard Ave S, ☎ +1 206 622 028. Su-Th 9AM-1AM, F-Sa 9AM-3:30AM. This is not a fusion restaurant, but rather a Macau style restaurant. Whic explains why you can order your Hong Kong style dishes with spaghetti and cream sauce. Purple Dot is open until really late on the weekends, where packs of 80 lb. red-faced co-eds can be spotted stumbling around in their glittery halter tops. The restaurant's decor may remind one of a Hong Kong style Mickey Mouse Club, with its colorful curved furnishings and fiesta patterned carpet. But at Purple Dot, the draw for authentic food overpowers the teeny bopper atmosphere, as during the day there are just as many families as there are clubbers at night. Wash down the cajun chicken wings with an iced lemon tea, or stick to Cantonese soul food like jook and wonton mein. 47.59957-122.3177414 Sichuanese Cuisine, 1048 S Jackson St, ☎ +1 206 720-1690. 11AM-9PM daily. The name in Chinese is Lao Sichuan (Old Sichuan Restaurant). Great dry-fried beans with chicken. Simpler hotpot than at Seven Stars Pepper, with tasty dumplings. 47.59904-122.3223615 Szechuan Noodle Bowl, 420 8th Ave S, ☎ +1 206 623-4198. Tu-Su 11AM-9PM. The name of the shop in Chinese means "Great King of Beef Noodles". Hole-in-the wall place. Limited selection of spicy noodle soups. Also provides dumplings. 47.60014-122.3273316 Fuji Sushi, 520 S Main St, ☎ +1 206 624-1201. Lunch M-F 11:30AM-2PM, Dinner Su-Th 5PM-9:30PM, F-Sa 5PM-10PM. Open for lunch, just around the corner from Maneki. Smaller pieces and a bit pricer, but fresh and tasty. 47.60048-122.3339917 Grand Central Bakery, 214 1st Ave S (in the arcade between 1st Ave and Occidental Park, just off S Jackson), ☎ +1 206 622-3644. M-F 7AM-5PM, Sa 8AM-4PM, Su closed. One of the best sources of artisan bread in Seattle, this place offers an excellent lunch, cafeteria style (but stylish!). 47.59988-122.3262218 Maneki, 306 6th Ave S, ☎ +1 206 622-2631. Tu-Su 5:30PM-10:30PM, M closed. Very good sushi, as well as many non-sushi Japanese dishes. The restaurant claims to be at least 100 years old, although it has moved since its estimated founding date in 1904, and is considerably smaller than the grand space it occupied prior to World War II. Their sushi pieces are very large, and their prices are very reasonable. It is highly suggested to reserve on the day before you wish to eat here. 47.6012-122.3339219 The New Orleans, 114 1st Ave S, ☎ +1 206 622-2563. Lunch M-F 11AM-3PM, Dinner M-Sa 3PM-close. Great gumbo and jambalaya, but the real winner is the fried oyster po-boy sandwich. Great lunch spot on the cheap. 47.5997-122.330620 Salumi, 309 3rd Ave S (between Main and Jackson), ☎ +1 206 621-8772. Tu-F 11AM-4PM. This is the place to eat lunch in Pioneer Square. There is often a line that can take over an hour to get through. Salami sandwiches on artisan bread... can't beat it. 47.59912-122.3169721 Seven Stars Pepper, 1207 S Jackson St, Suite 211 (Ding How Plaza). A local hotpot with great hand-shaven dandan noodles and chonggin hot chicken. 47.59941-122.3182822 Tamarind Tree, 1036 S Jackson St, ☎ +1 206 860-1404. Su-Th 10AM-10PM, F-Sa 10AM-midnight. It's worth the awkward crawl through Seattle's steepest and most congested parking lot to relax with a Tamarind Soda next to the cool contemporary-style fountain. Tamarind Tree is an anomaly in Little Saigon, to say the least. Three Vietnamese brothers created an atmosphere that feels like it should be located in a Belltown Hotel rather than a Vietnamese ghetto, and the place packs in more flavors for under $9 than any other restaurant. Try the fish paste with bacon, or the seven courses of beef. High quality service, sauces, and appetizers, served up artfully at Little Saigon prices. Try the spring rolls with a side of fresh peanut sauce. 47.59741-122.3275723 Uwajimaya, 600 5th Ave S, ☎ +1 206 624-6248. M-Sa 8AM-10PM, Su 9AM-9PM. The food court at Uwajimaya, and the accompanying Uwajimaya grocery store, deserve special mention. The grocery store offers specialty items for almost all forms of Asian cooking. They have great produce, though not always the best prices. But most importantly, they have obscure items like Kafir lime leaves or entire lotus roots, labeled in English. The food court offers a wide variety of Asian cuisines, ranging from Hawaiian BBQ to Hong Kong style baked goods, and everything in-between, though the Thai offerings are not so good. The Chinese steam tables offer reliable, western-style treats in large quantities for cheap. There aren't any real Japanese offerings, but the grocery store deli has plenty of sushi and other Japanese lunch items available. The Korean establishment, Shilla Korean Bar-B-Q, is probably the best out of the entire court, with very reasonable prices and large portions. Bubble tea arrived in the International District in the late 90s. Places here originally served it in basic plastic cups with dome lids, though now all the bubble tea cafes in the district vacuum seal the tops of each cup with semi-permanent plastic covers. 47.59823-122.325881 Ambrosia, 619 S King St, ☎ +1 206 623-9028. This was Seattle's first bubble tea establishment. Well known for its long lines and the curt Taiwanese "bubbletea nazi" that ran the cash register. Other bubble tea cafes followed suit, thus thinning out Ambrosia's clientele. 47.59825-122.324912 Gossip Espresso & Tea, 651 S King St, ☎ +1 206 624-5402. This prime corner storefront used to be Seattle's oldest meat market. Gossip is now a popular hangout for neighborhood teens. A spiral staircase leads to a second level lounge where the original ornate ceiling panels still exist. Cash only, also has karaoke downstairs. 47.59812-122.326543 Oasis Tea Zone, 519 6th Ave S, ☎ +1 206 447-8098. Pool tables, Ikea furniture, and music videos entertain a mostly younger crowd. Oasis is known for its more fragrant-tasting bubble teas; specifically, they make fruit teas with real fruit. 47.59826-122.32624 Maekawa Bar, 601 S King St, Suite 206 (next to Ft. St. George). Seattle's only Izakaya. Serves Japanese pub grub, which is delicious. Generally busy, but a good place to spend an evening eating and drinking. They have an award above the bar for being Seattle's best Izakaya, but generally don't appreciate you pointing out they're the only one. Go downstairs for Karaoke. 47.59991-122.326135 Panama Hotel Tea & Coffee House, 607 S Main St, ☎ +1 206 515-4000. The result of a unique renovation, Panama Hotel is both a teahouse and historical museum. Fine tea connoisseurs appreciate the wide selection of quality teas. The Panama Hotel once housed the personal belongings of interned Japanese Americans who had to sell their homes and abandon their businesses. The belongings that were never claimed, including pieces of furniture and a piano, are on display here. 47.6026-122.332336 Trabant Coffee & Chai, 602 2nd Ave. Independently owned, the shop also doubles as an art space. This is a true Seattle coffee shop with modern design, great espresso, a Clover coffee brewer, and competition-level baristas. Want to learn more about coffee? These people love answering questions. You may even stumble into an impromptu tasting! 47.5991-122.331867 Zeitgeist, 171 S Jackson St. Elegant and arty. 47.60104-122.333198 The Last Supper Club, 124 S Washington St. One of the most popular nightclubs in Seattle, ideal for singles. The DJs usually spin hip-hop on Friday nights and dance/techno on Saturday nights. 47.60156-122.335231 Best Western Plus Pioneer Square, 77 Yesler Way, ☎ +1 206 340-1234, toll-free: +1-800-800-5514. Check-in: 3PM, check-out: 11PM. Built in 1920 and refurbished a number of times, it's the most decent hotel in the Pioneer Square area. Rooms are compact but breakfast are generous and it's close to the King Street station and the stadiums. From $180 per night. 47.59845-122.327312 Hostelling International Seattle (formerly the American Hotel), 520 S King St (at 6th Ave S), ☎ +1 206 622-5443, fax: +1 206 299-4141, e-mail: seattle@hiusa.org. Check-in: 3PM, check-out: 11AM. Offers free breakfast, free wifi. Excellent common areas including a library, tv room, computer room and clean, spacious kitchen facilities. The location isn't the greatest, given the grit outside, but it is near everything and just a block from King Street Station. Starting at $29. 47.59991-122.326043 Panama Hotel, 605 1/2 S Main St (middle of the building along south side of Main St between 6th Ave & the alley in the middle of the block. Fourth door up the hill to right. ), ☎ +1 206 223-9242. Private, old-fashioned rooms, modest but clean, with bathrooms down the hall. Very relaxing tea and coffee house (see above), with free wireless internet connections. On the street level. From $90. 47.602413-122.3326914 Courtyard Seattle Downtown/Pioneer Square, 612 2nd Ave, ☎ +1 206 625-1111. Hotel located in the historic Alaska Building, just around the corner from Pioneer Square. Pioneer Square and Occidental Park, as with many parts of the downtown area, are best avoided at night, since they get shady when the beggars, the homeless, and possible crime abound. The International District is noticeably safer, especially the area between 4th Avenue S and Interstate 5, but watch out for drunks after midnight. The City of Seattle provides free wi-fi access in Occidental Park. Use the SSID "seattlewifi". Seattle Public Library. All branches of the Seattle Public Library have open wireless, using the SSID spl-public. Public computers with Internet access and basic office software are available for up to 90 minutes at a time, but require either a SPL library card or a temporary pass available from the circulation desk. Free. 47.59615-122.322671 International District/Chinatown Branch, 713 8th Ave S, ☎ +1 206-386-1300. M-Tu 1PM-8PM, W-Sat 11AM-6PM, Su 1PM-5PM. This district travel guide to Pioneer Square-International District is a usable article. It has information for getting in as well as some complete entries for restaurants and hotels. An adventurous person could use this article, but please feel free to improve it by editing the page.